Next time you compliment a woman at a party that’s she glowing, it may literally be so. 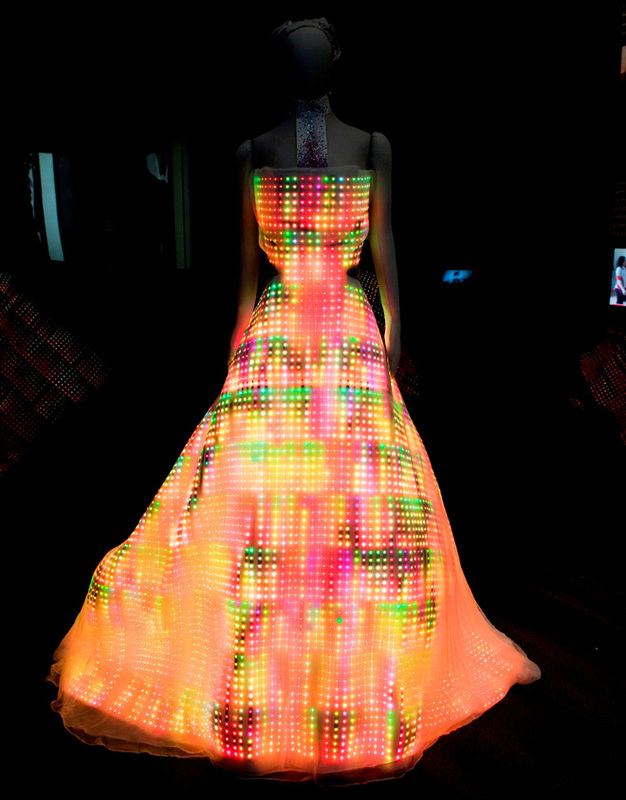 Two London-based designers have created a dress embroidered with 24,000 full color LEDs. The ‘Galaxy Dress’ claims to be the largest wearable display in the world and it will be the centerpiece of an exhibit at the Museum of Science and Industry in Chicago. “We used the smallest full-color LEDs, flat like paper, and measuring only 2 by 2 mm,” say designers Francesca Rosella and Ryan Genz in an e-mail. “The circuits are extra-thin, flexible and hand-embroidered on a layer of silk in a way that gives it stretch so the LED fabric can move like normal fabric with lightness and fluidity.” The duo run an interactive clothing company called CuteCircuit. Beyond the LEDs themselves, the Galaxy Dress is crafted in a way that should make the pickiest seamstresses proud. 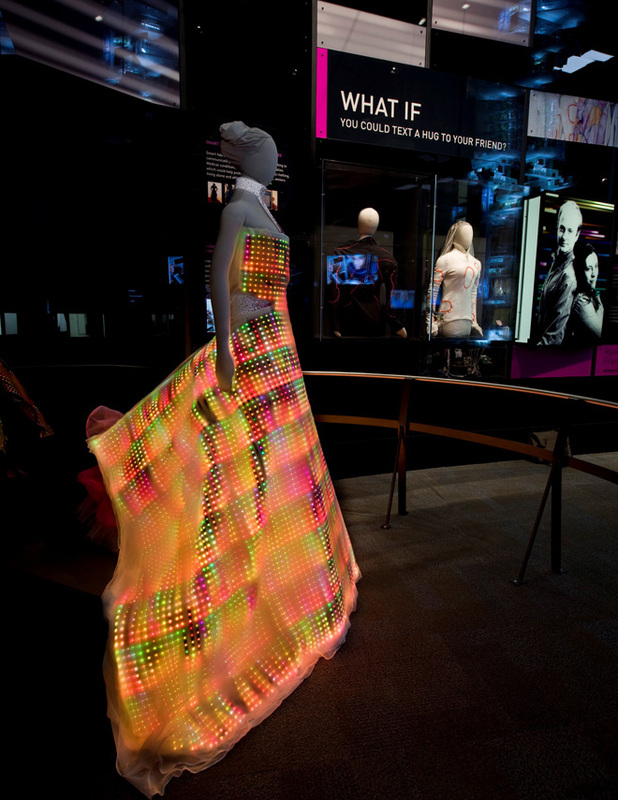 To diffuse the LED light, the dress has four layers of silk chiffon and a pleated silk organza crinoline skirt. The extra-thin electronics allow the dress to follow the body shape closely like normal fabric. Instead of having one large and heavy battery, the dress is designed to run on many tiny iPod batteries hiding in the crinoline, says Rosella. “They are not visible or uncomfortable,” she says. With the batteries, the Galaxy Dress wearer can walk around — all lit up — for anywhere from 30 minutes to an hour. The areas without LEDs are decorated with more than 4,000 hand-applied Swarovski crystals that range in color from clear to bright pink. “The dress looks good even when it is switched off,” say the designers. So far, the dress hasn’t been worn by any real woman. It went straight from the fitting model to the museum. 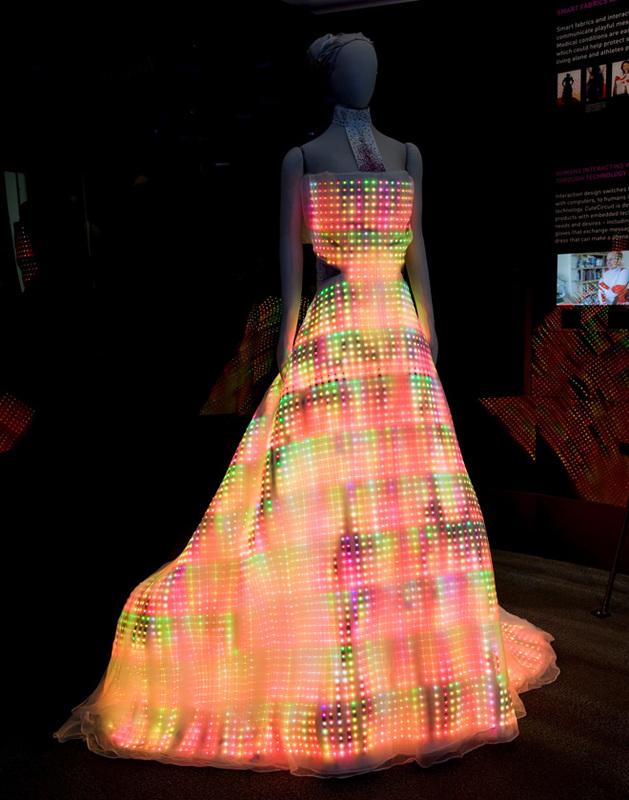 See a video of the LED Dress that, according to the designers, consumes about the same electricity as two household bulbs.